Crash! What happens if you get into an accident while traveling on business? Who pays if you get into an accident during a business trip? Will your auto insurance policy take the hit or will your company’s insurance policy cover the damage? If your work takes you on the road or up in the air (though probably not with George Clooney), you might be overlooking important questions about your insurance coverage. Accidents are considered either at fault or not at fault. It doesn’t matter if you’re working or playing, the cause of the accident and wherein the fault lies is what determines which insurance policy should respond. It’s critical to call the police in the event of an accident so sworn statements can be made which will be reviewed by the insurance company. Taking photos of the damage to your vehicle will also help prove your claim. However, in the case of a work-related accident, the type of auto insurance policy you have could affect the way you file your claim. If your travel consists of driving your own car to the airport, you most likely have a personal policy, but if your job relies on using company transportation, you’re probably looking at a commercial policy. Some businesses are required to register vehicles as commercial with the Department of Motor Vehicles and some businesses choose to register private passenger vehicles as commercial. If you’re driving a company car, make sure you know how that vehicle is registered. If you get into an accident while traveling for business, you will follow the same steps as you would if you were in an accident outside of work, but your employer will most likely file the claim. Check with your boss or HR department to find out the exact procedure for filing a claim. 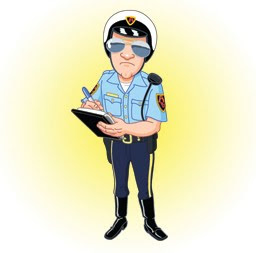 After obtaining a police report, you can submit it to your employer and they can file the claim with the insurance company. The insurance company will then respond to the policy holder to decipher damages and injuries. Rental cars are a common area of concern with business travel. Pay attention to how you are listed on the rental agreement. This will be especially important if you get into an accident and you or your employer are responsible for any damages. If you are renting a car personally while on vacation, take at look at my previous post on Rental Car Insurance for some extra insight. Start by consulting with your insurance agent to determine whether or not your vehicles need to be registered as commercial. As a business owner, the smart (and sometimes required) move is to carry a Business Owner Policy also known as a “BOP”. This policy includes liability for personal injury and property coverage for the contents that enable you to run the business. With this policy, you can add or endorse the policy to include a coverage part known as Hired & Non-Owned Auto. This provides liability coverage only to protect the business in the event you rent a car for business. It does not protect against physical damage coverage. In addition, this coverage does not include injuries to the employee or third party. If your employee suffers serious injuries while in a rented vehicle during company business and their personal auto insurance is not sufficient, your company could be held responsible. Such claims could be catastrophic and yet, the cost of this endorsement could be less than $200 per year. Think about it – your business could be wiped out if you get into an accident and don’t have the right coverage. That’s why I strongly recommend that business owners discuss business operations, employees, and how you use of vehicles to operate your business. It could save confusion and a lot of money if an accident occurs. Linda Rey is a licensed insurance agent at Rey Insurance with a broad spectrum of expertise in life, accident, health, property and casualty insurance as well as retirement planning and college funding strategies.